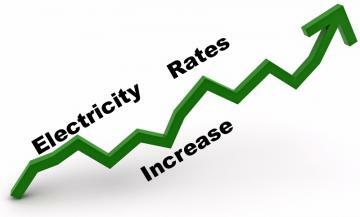 Electricity prices set to rise between 10% and 13% in 2015! You are here: Home / Featured Stories / Electricity prices set to rise between 10% and 13% in 2015! As you know , ESKOM was granted permission by NERSA some years ago for an 8% year on year electricity tariff hike, this so that ESKOM could generate income for repairs , maintenance and upgrades. We have all felt this bite so far – but there is more bad news on the horizon. At the end of July 2014, ESKOM was granted a further increase of between 2% and 5 % ABOVE the 8% already slated for implementation on April 1 , 2015. This is to recover some R7,8 Billion they they had UNDER RECOVERED between 2010 and 2013. ESKOM had applied for R 18,4 Billion! What all this means is that WE , the consumer will now be responsible for that R7,8 billion recovery. 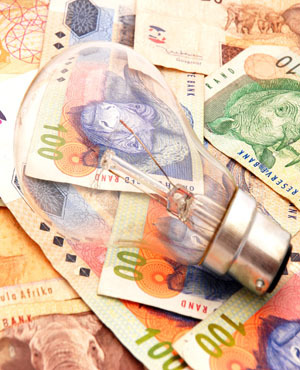 By raising the electricity tariffs by an additional 2%-5% next year, the extra income generated through this “taxation” will give back to ESKOM a portion of the R18,4 billion under recovery. However, around mid July , ESKOM announced a 40% increase in profit for the financial year ending 31 March 2014 – equating to R 7,1 BILLION ! That’s why we , the consumer, need to pay ESKOM from our pockets AGAIN! I personally am quite incensed by the cheek of it! That I must now pay more over and above the 8% tariff increase and this will in turn have the knock on effect on every thing else that we are already paying dearly for. I am now going to embark on an even more rigorous path to pay ESKOM as LITTLE AS POSSIBLE , by finding every conceivable way to reduce my dependence on and my use of electricity. And, while I know that I will have to use electricity – I sure as hell can make sure that I use as little as possible! If all of us could reduce our consumption by around 25% , not only would it seriously cushion the impending tariff hike , but it would allow us to invest those savings in more energy efficient systems for our homes and businesses. So , I am calling on everyone who reads this to pass it on to everyone you know and take action now! We are traditionally a nation of procrastinators and I am challenging you to change that! Start your energy saving strategy now. Start small. Look at reducing the usage that will save you the most now and is the most cost effective to do and then look at implementing more long term measures. So , what can you do right now? You can maximize your geyser efficiency. Insulate your home. Switch lighting to CFL and LED and look at your air conditioning efficiency. We have traditionally balked at investing in energy efficiency for the usual BS , but we have to act. What do you despise more ? Spending your money on products that will help you save money, use less electricity and reduce CO2? Or giving your hard earned cash to ESKOM and contributing to their R7 billion PROFIT!!! I know which hurts a hell of a lot less! I started Saving Energy to provide you with accurate information to allow you to make informed decisions to reduce your energy consumption and save money every month. In response to your demand, we have set up services in the major national areas that offer high quality geyser timer and geyser blanket installations – and these are proven to reduce your electricity consumption by between 25%-40%! We have specialist partners in Solar Energy , Air Conditioning and Insulation that deliver energy saving options. Plus we offer energy and water saving shower heads and a range of “touch taps” designed to reduce your water and electricity usage. The truth is that all of this is utterly USELESS if you don’t implement it. Start small – but START.